In a previous post, I discussed the economic value of various college degrees. I provided a response to the question, “How much can I earn with a degree in…?” Students will benefit from a professional degree with a strong liberal-arts general education, or a humanities degree with a professional minor. But, now I want to flip the perspective. From the employer’s perspective the question is, “How much can I earn if I hire a college graduate like you?” A college degree opens the door, but demonstrating that you have employable skills, whether they be soft-skills or technical, is key to landing a job. The economic reality of the labor market in the for-profit world is that wage income is related to a person’s ability to produce goods and/or services an employer can sell for a profit. The more efficient you are, the more valuable you will be to an employer. A degree signals that an applicant has accomplished the academic requirements of a major, has participated in the culture of the college, and developed a network of relationships. In many cases a degree will accompany an internship in a graduate’s field of interest. For some professions, a degree is a requirement for taking a licensing exam—such as the CPA exam for accountants or RN boards for nurses. One emerging trend is for employers to increase their assurance that new hires have the skills indicated on their resumes. Digital badges provide such evidence. They are earned by demonstrating a specific skill or attribute. Think of digital badges as mini credentials that can be displayed on one’s LinkedIn account or a digital portfolio that provide evidence of employable skills or accomplishments. Digital badges are achievements verified through credible organizations, trade associations or accredited schools. They are awarded upon demonstrating specific skills. In the ebook, Game Changers: Education and Information Technologies, the authors present a case study for how Mozilla is advancing the cause of using open-badges as an alternative to or supplement for traditional degrees. Badges are earned and awarded when individuals demonstrate their competency in a particular task or skill. For instance, if you apply for job that requires skills in Photoshop, PowerPoint, and grant writing, you can apply for a badge by testing your competency (or providing evidence that is peer-reviewed) at organizations such as Smarter or Lynda.com and some colleges. Once they are obtained, you can display badges on your LinkedIn account. An employer can click on the badge and discover the credentialing organization to verify its credibility. Upon graduation, the traditional transcript lists the degree conferred, courses taught, and grades earned; however, forward-thinking schools are also including digital badges as symbols documenting specific competencies or experiences that contribute to your productivity. Think of them as microcredentials that enhance your employability. 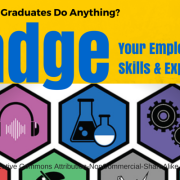 Along with your degree, you can enhance the way you market your employable skills by earning and displaying digital badges. Doing so can be part of a commitment to lifelong learning and continuous enhancement of your productivity. Employers will then have more information indicating the specific types of skills and experiences that will make you a competitive candidate. What kind of income can I hope to earn if I graduate with a history degree? Or, would I be better off to major in business? These are questions prospective students and parents have asked me for years. And for good reason. With the rising cost of higher education and subsequent student loan debt, asking the economic return of a degree is a prudent question. 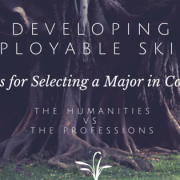 What are the trade-offs between obtaining an undergraduate degree in the humanities or obtaining an undergraduate degree in one of the professions? The answer depends on whether you take a long or short-run view. Yes, business is the most popular degree in the USA. According to the National Center for Educational Statistics, of the total 1,840,164 undergraduate degrees conferred in 2012, business represented 360,823 (13%), whereas history and social science combined represented 178,534 (9.7%). The National Association of Colleges and Employers reported the 2014 average starting salaries of all bachelor degree graduates was $48,707. For business majors the average was $57,229 (17.5% above average) and for humanities and social science it was $38,049 (21.9% below average). 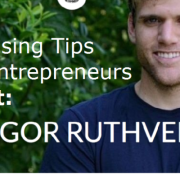 Clearly, if you want to beat the average for starting wages, major in business. But how do graduates fare in the long-run? As it turns out, a study from the Association of American Colleges & Universities, revealed that liberal-arts majors (including history, humanities, and social sciences) earn over $2,000 more in their peak earning years (mid 50s) than those starting with a professional degree. Even though liberal-arts majors start out with lower paying jobs, as a group, they advance rapidly in their earnings and overpass their peers who majored in business. Why? Three reasons can be given. First, they often start out in human services oriented jobs with lower wages, but migrate to higher paying jobs later. Second, they are well prepared for graduate school, or MBA programs, which helps to advance their careers. Finally, the focus of a liberal-arts degree emphasizes those skills and intangible attributes that employers say they want: writing, communication, persuasion, problem-solving, service, creativity, and critical thinking. For instance, Carly Fiorina was the first woman CEO at Hewlett-Packard (HP) and for any other Fortune 50 company. After college, her first job was as a receptionist. Then, she was an English teacher. This was after earning a degree in medieval history from Stanford University! Fiorina went on to earn an MBA and began advancing in a career at Lucent prior to being appointed CEO at HP. She credits her business leadership success to the analytical, critical thinking, and communication skills emphasized in her undergraduate history studies. So what major should you consider? Here are three options and a suggestion. Major in a degree in the humanities such as history, literature, arts, design, communication, the classics, or pre-law. Any of these majors will require a considerable amount of reading, writing, and performing. Each will hone reflective and listening skills and build your capability of synthesizing information. You will develop an appreciation for diverse ways of viewing the big questions in life and learn to distinguish between the meaningful and meaningless. Moreover, you will develop an appreciation for living a life worth leading. Of course, you will also develop long-term employable skills such as creativity, communication, leadership, global awareness, and critical thinking. Major in a professional degree such as business, computer science, or engineering. Graduates with these majors are in high demand and the initial pay after graduation is among the highest. The focus of these degrees is to develop competencies in the technical skills required for entry-level work. For instance, being able to interpret financial reports, identifying market segments, writing code, designing circuits, or converting CAD drawings to outputs on a 3D printer. The assumption is that through general education the student has the basic language and mathematical knowledge as pre-requisites to learning the technical skills. Most programs also provide specific training or a period of mentoring as part of the on-boarding process for entry-level professions. Study both. Select a school with a strong reputation of liberal-arts general education (often these are smaller, private, or faith-based) and major in a humanities degree and minor in a profession, such as business. Alternatively, major in a profession and minor in the humanities. Yes, you can do both and usually graduate within four years! Your general education courses are not just something “to get out of the way” before you take your courses in your major. Rather, the liberal arts sharpen the mind, enhance communication capabilities, build resilience, and inspire creativity. Remember, the intellectual foundations of a challenging liberal arts general education and professional education are essentially the same. In a recent national survey conducted by CareerBuilder, hiring managers indicated that the complexity of their organization and markets requires a broad set of skills. This result suggests more emphasis on “real world learning.” To acquire experience in the workplace, try out an internship and gain on-the-job skills. This will give you opportunity to apply your theoretical knowledge in a more controlled, but nevertheless, professional setting. For more information, you can download a free e-book from AAC&U describing research on how liberal-arts and science majors fair in the job market. http://rjchilds.com/wp-content/uploads/2015/07/AAEAAQAAAAAAAAMiAAAAJDgzZDlkZDAyLTYzMDYtNDI4OS04MjQwLTA5NzMwZjlkNTlhMQ.png 315 549 Joseph Childs http://rjchilds.com/wp-content/uploads/2015/07/Joe-Childs-Logo-300x95.jpg Joseph Childs2015-06-11 18:50:192015-07-07 18:52:33What Is a College Degree Worth? A former student recently contacted me asking for career advice. She is working in public accounting as an associate at a top ten firm. Passing all her CPA exams on her first try, she is a rising star at her office with excellent performance reviews. She called to ask my opinion about how to communicate with her career coach. “I plan on telling my coach what I want out of my career. Either the firm needs to meet my needs, or I’m going to tell them I have to look for another company,” she said. Continuing, “My coach happens to be my direct report manager and is also a friend.” It was clear this alumna’s goals included looking for more opportunities that offered a more stable work schedule and cross training in another line of business with the firm. 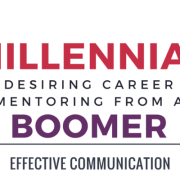 She also displayed characteristics typical of millennials in the workplace: needing to be heard, asking for structure, seeking purpose, and desiring friendship. Begin with your end goal in mind, but start with a question, not a demand. I suggested she ask her coach, “What skills and abilities do you see in me that could be used in other lines of business at our firm?” I suggested that the response she receives may be the answer she was looking for, or open her eyes to something of interest that she had not yet considered. By using this approach, the power remains with the coach, but the choice remains with her. Share your desires, but demonstrate loyalty to the firm. For instance, she could state, “Can you help me find opportunities, within the firm, for someone with my skills that provide more stable work hours?” This approach shows the coach her commitment to the firm and a willingness to align her desires with the firm’s needs. Express gratefulness for the opportunities you have had thus far and share how the work has provided purpose, but also express the potential benefits of a new assignment. Demonstrate how it will accelerate your sense of purpose and motivation with the firm’s mission. “I feel the work I’ve been doing for our major client is making a difference. How do those in another line of business find meaning in their work?” The doors should be open for meaningful options to employees who seek that purpose within the firm. Understanding the distinction between friendship and the transaction-based reality of manager-subordinate relationships. Treat this meeting as a mentor-mentee relationship as opposed to peer-to-peer. Save the small talk for after the work-related discussion. “Besides the strengths you’ve shared with me, please tell me the top two areas needing the most improvement if I am to advance at this firm?” Relationships are important for millennials, but compartmentalizing the roles are key to maintaining healthy boundaries. Develop comradery at work, but build the friendship after hours. It’s great to be able to work with others you actually enjoy as friends. I love working with and mentoring millennials. They keep me feeling young and idealistic. A week later, I spoke to this alumna. She was excited to report that her conversation went well. She was offered an opportunity to transition to another line of business that met her needs. Her coach reinforced the firm’s commitment to help millennials build their careers.